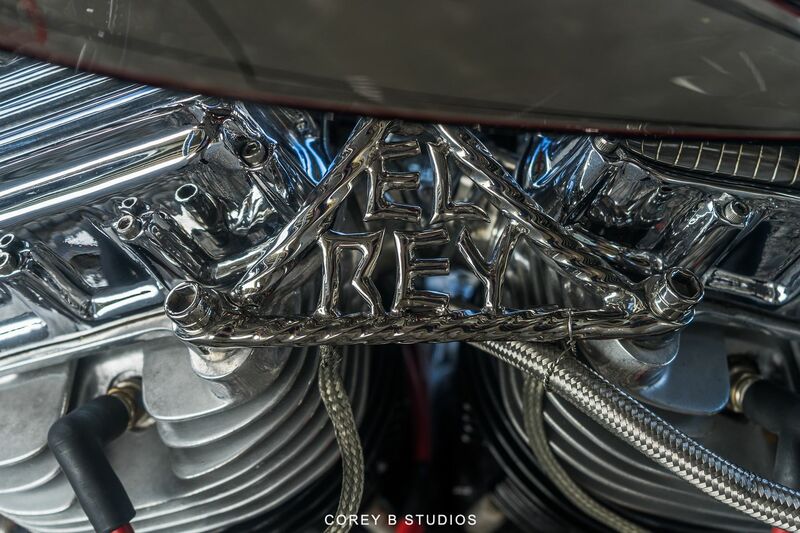 EL Rey is a 1957 Harley Davidson. 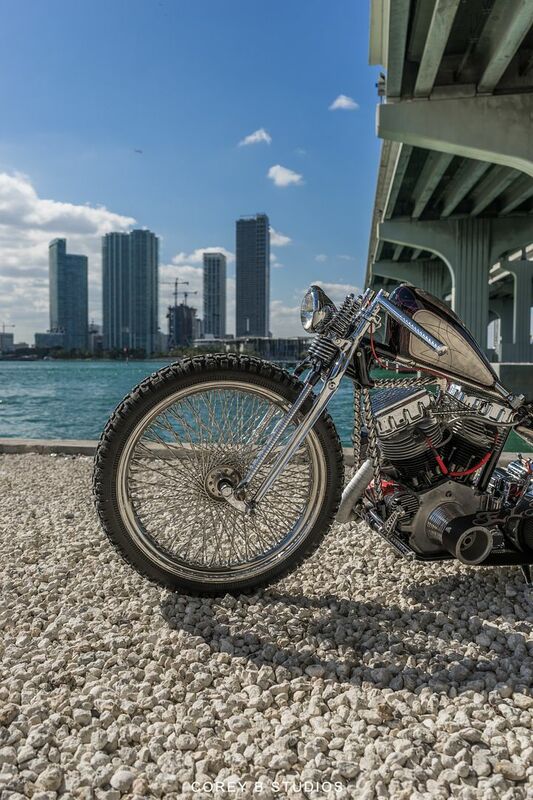 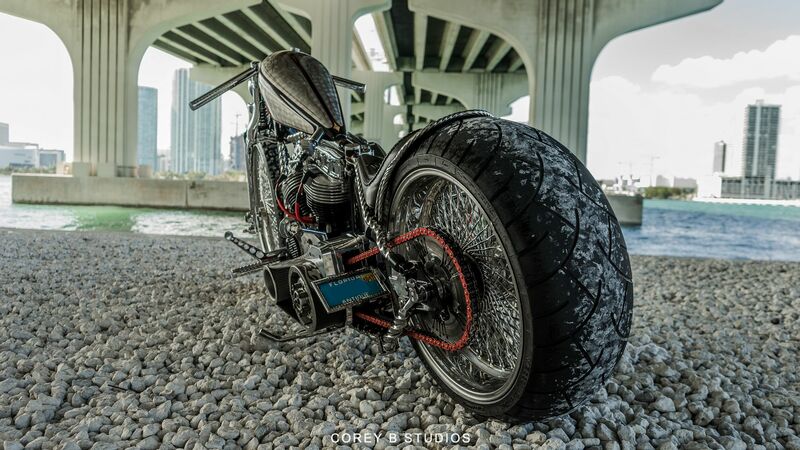 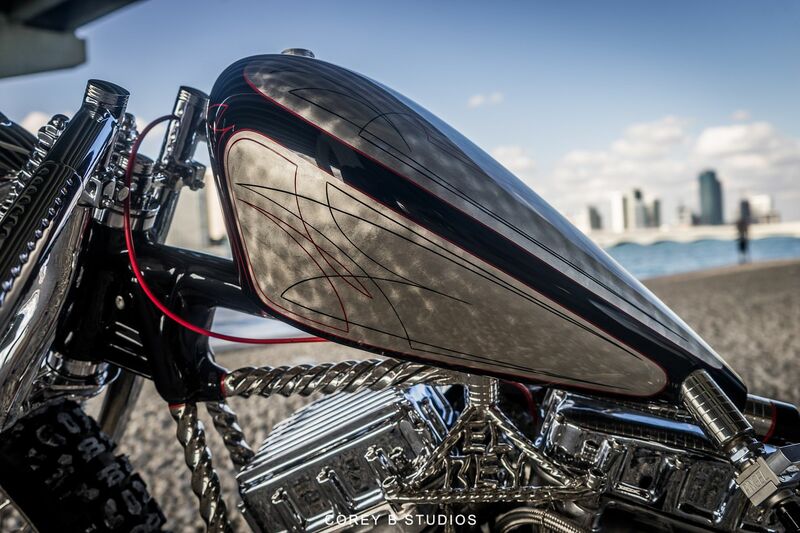 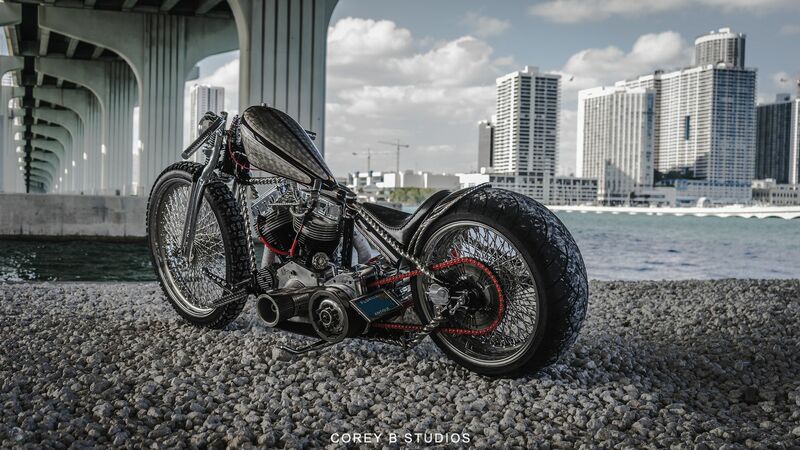 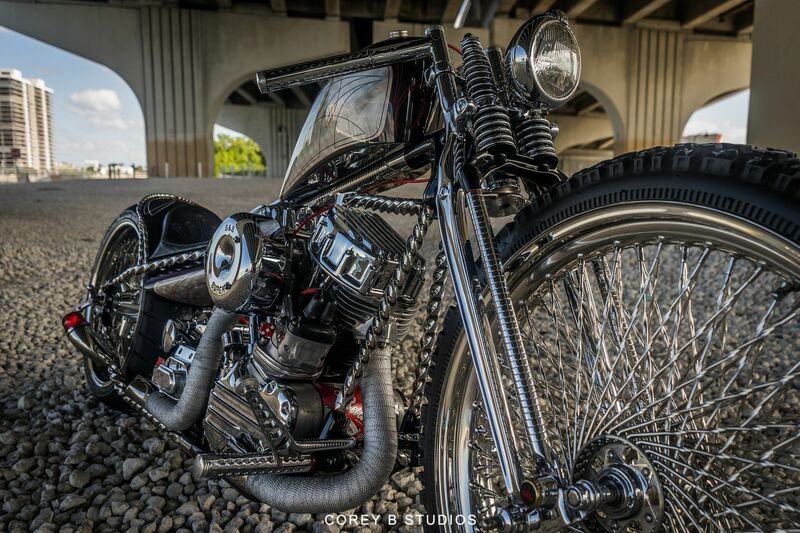 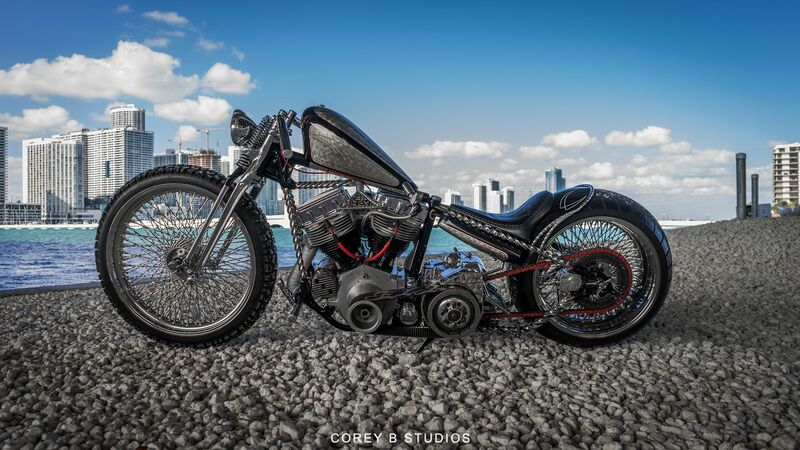 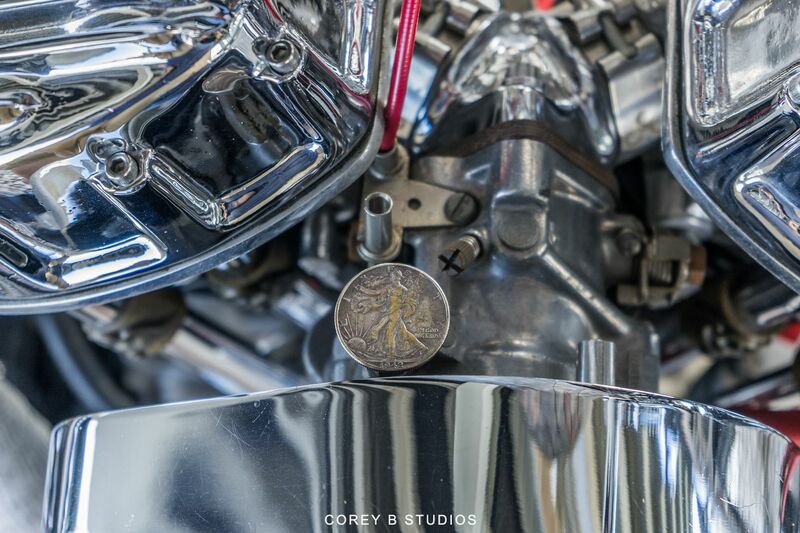 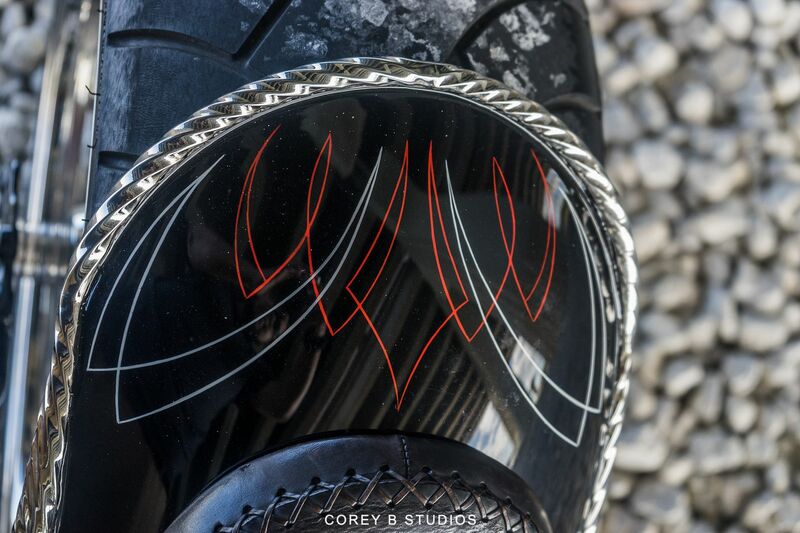 This motorcycle is the result of 15 years of sweat, blood and creative learning. 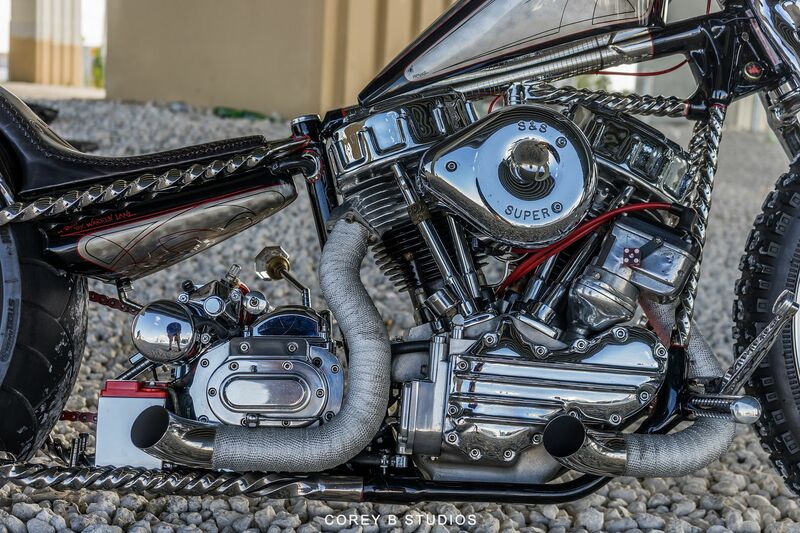 Builder Warren Lane the elder brother of the infamous Billy Lane, together with the help of other craftsmen, modified, formed, and fabricated everything you see. 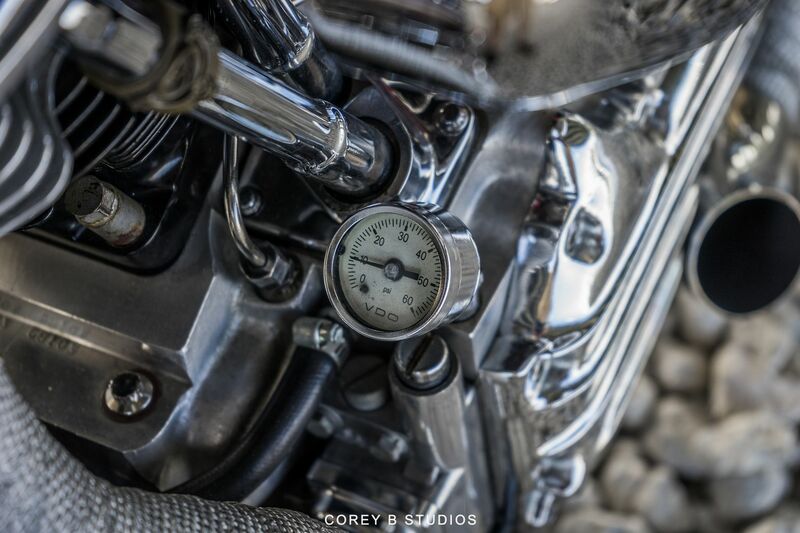 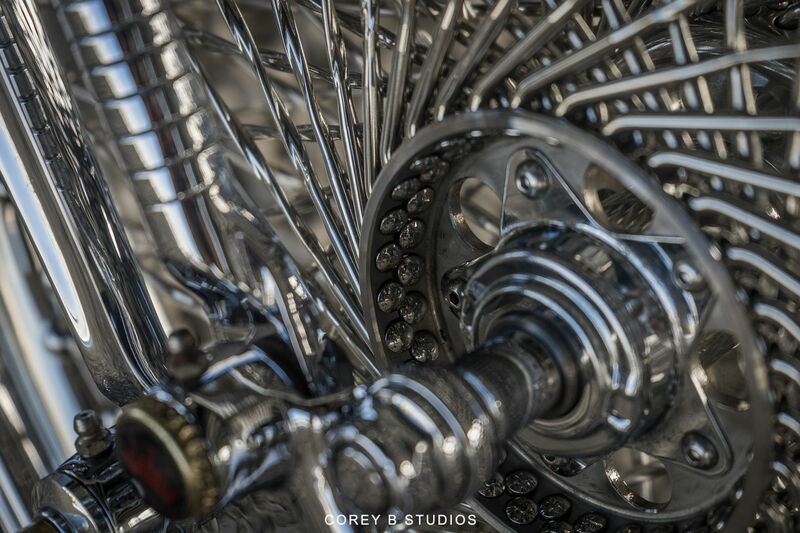 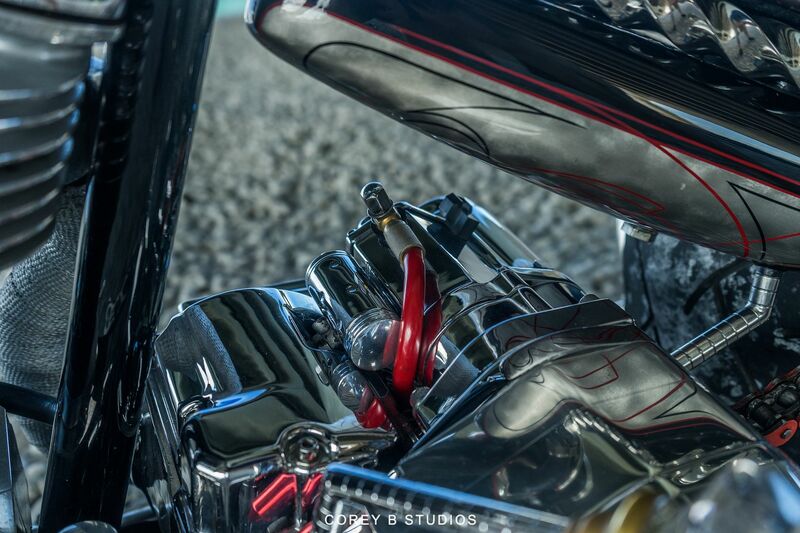 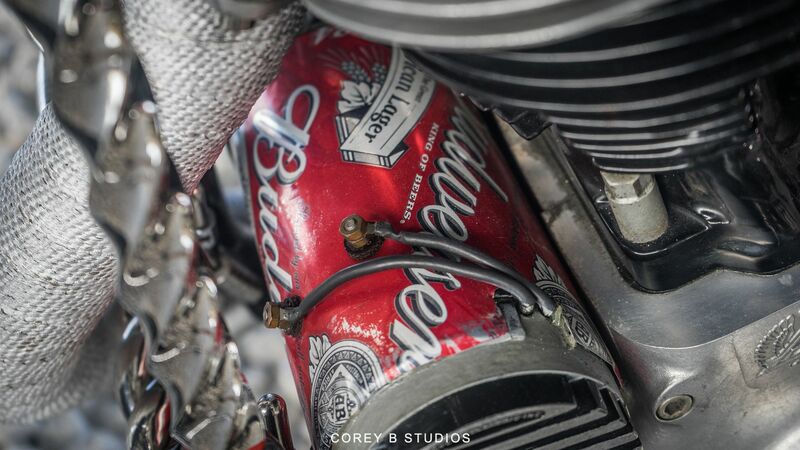 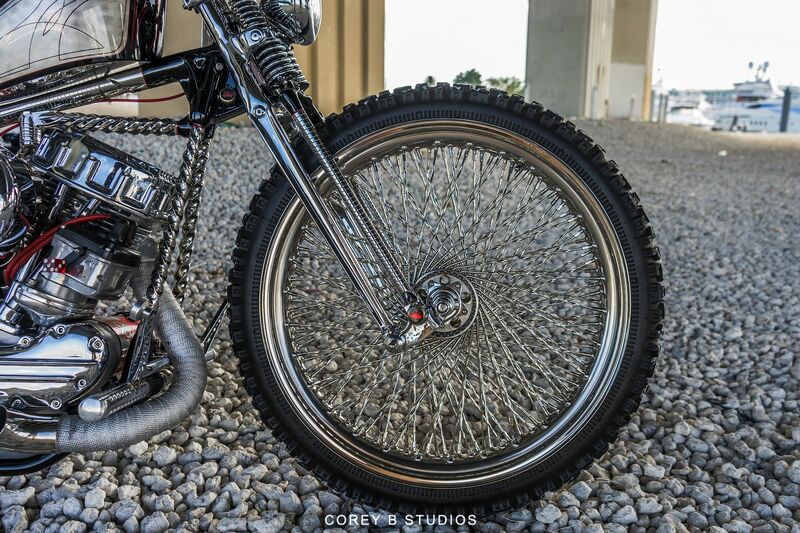 It is truly a piece of motorcycle art and function. 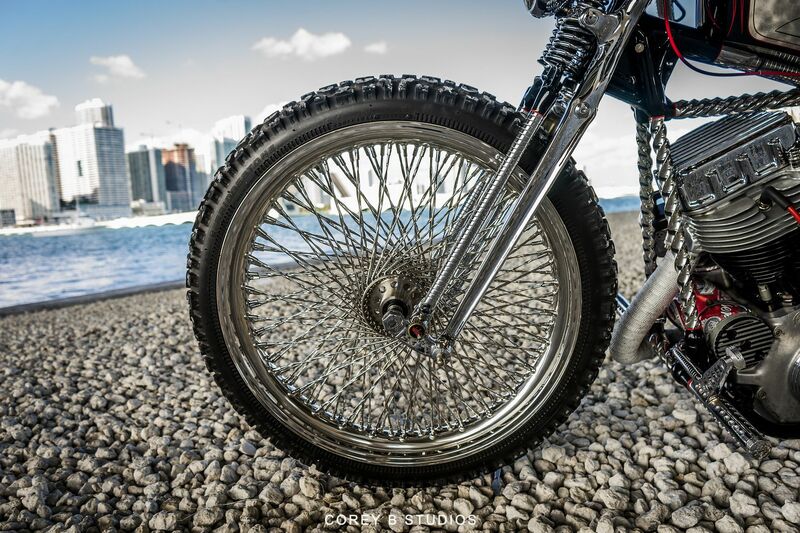 23” front wheel, polished stainless spokes, hub, and rim. 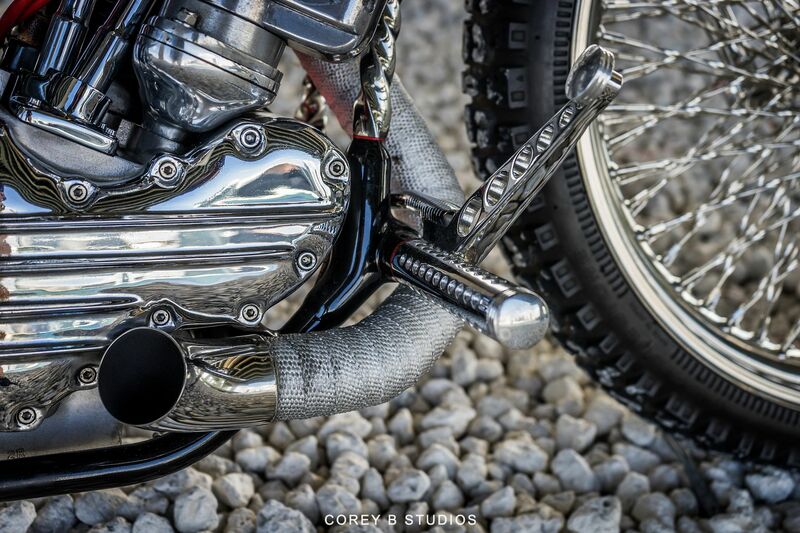 Designed by Warren lane. 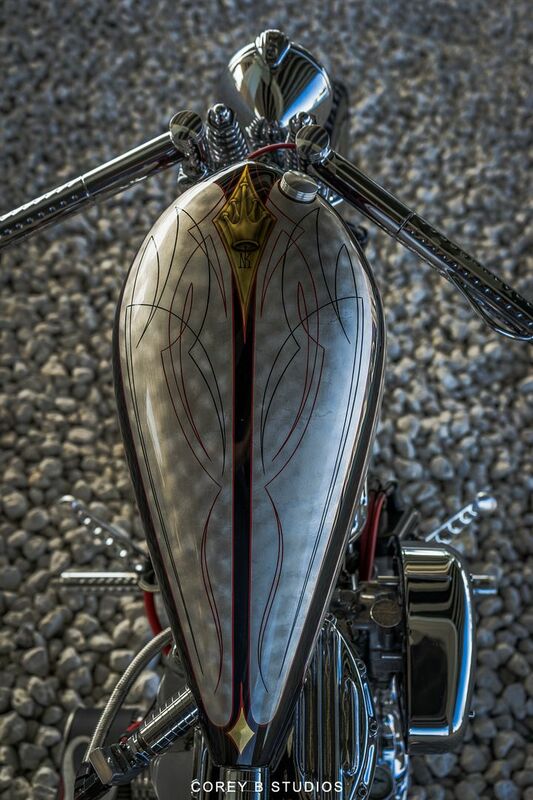 Chrome 1934, HD, VLD springer front fork. 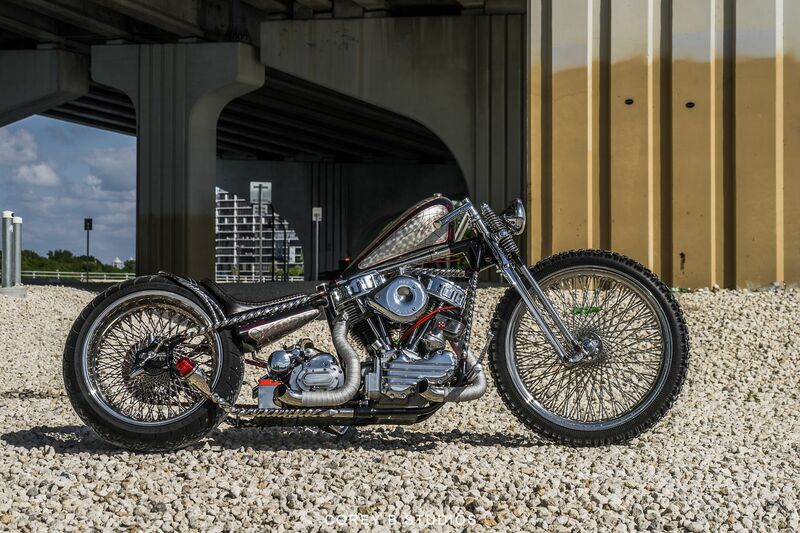 Highly modified by Warren lane. 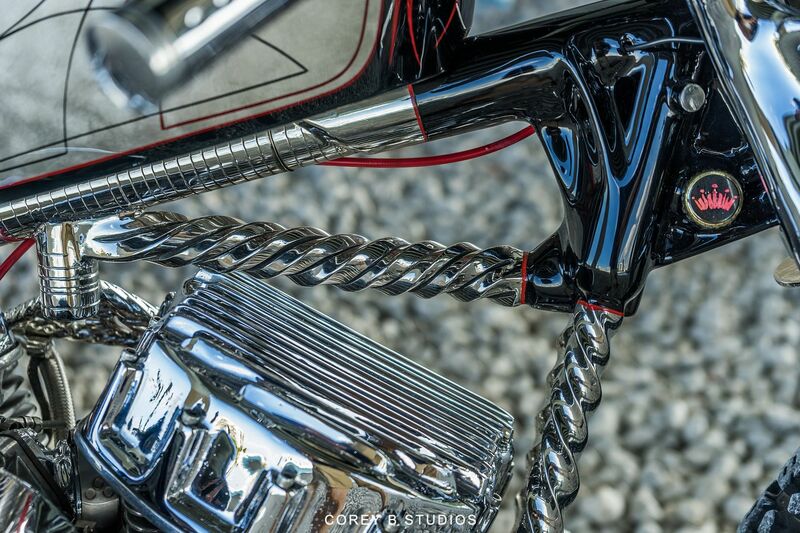 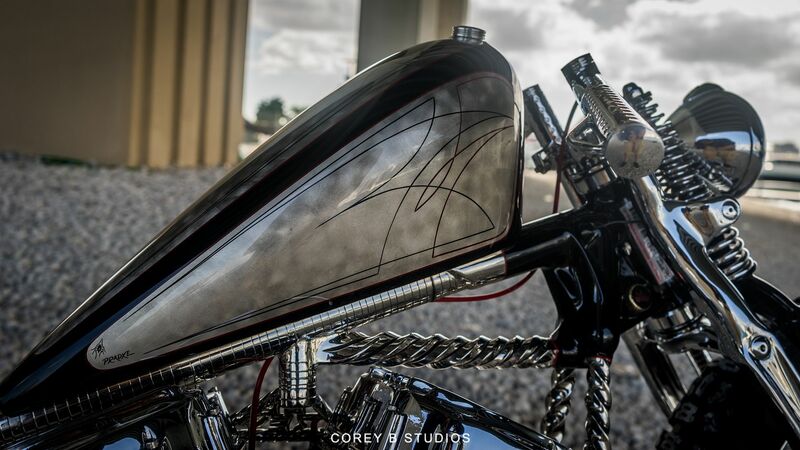 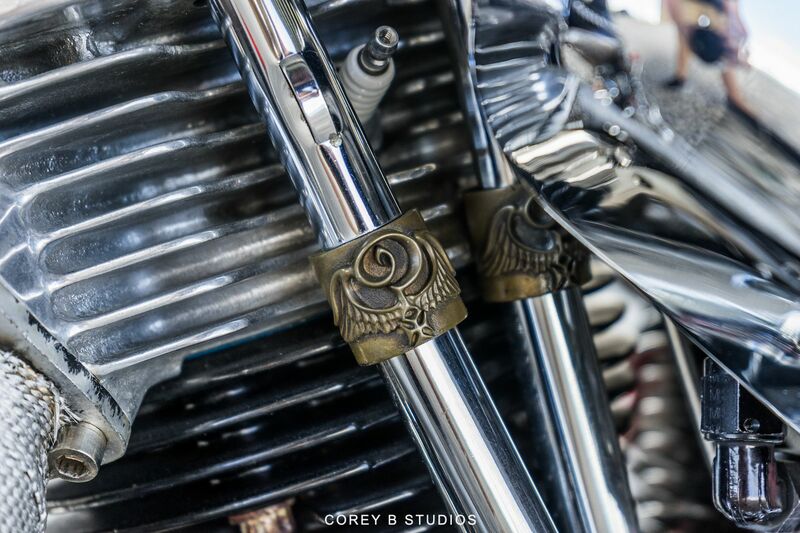 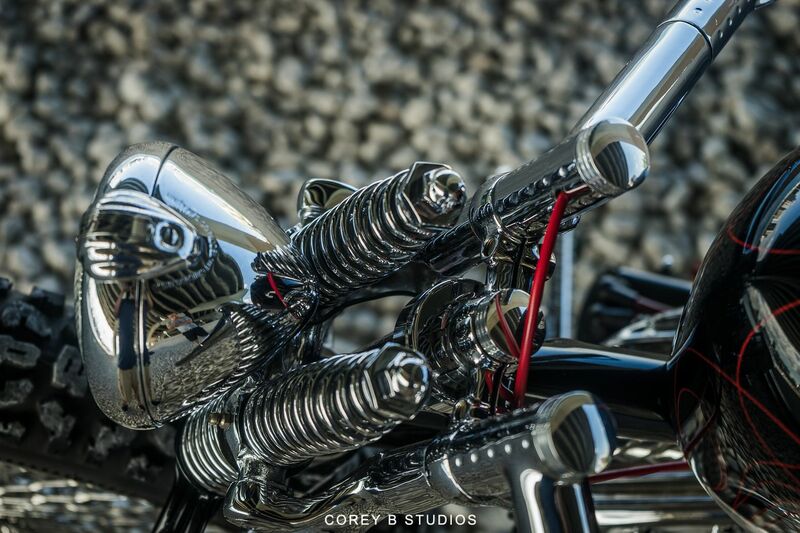 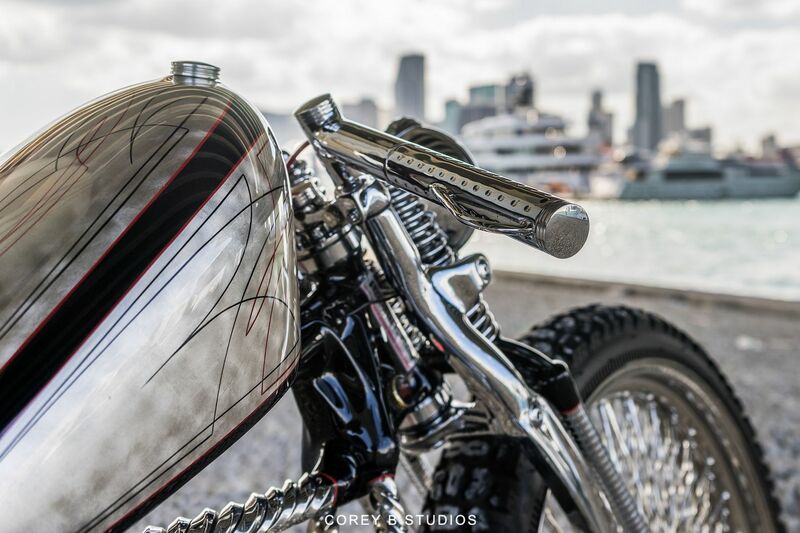 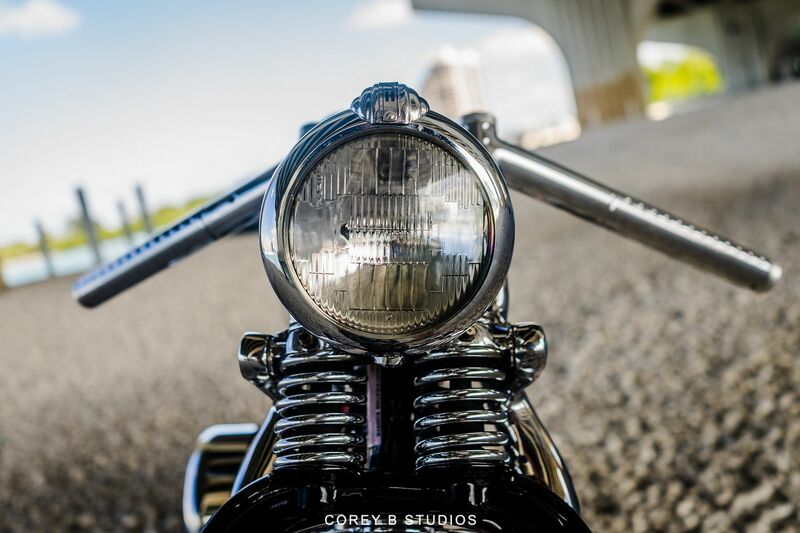 Chrome handle bars with internal throttle, and throttle wing, made by Warren Lane. 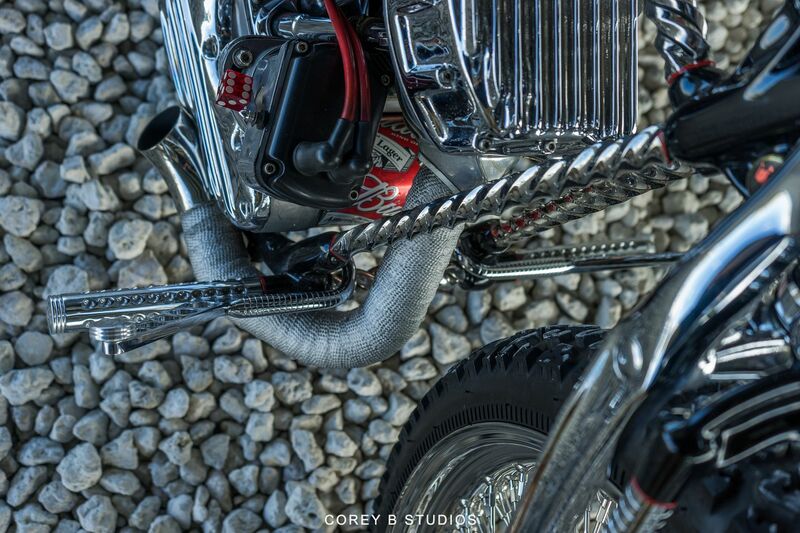 1957 HD frame highly modified by Warren Lane, twisted stainless steel in the blacksmith shop (Ray & Andrew) Twisted stainless steel everywhere. 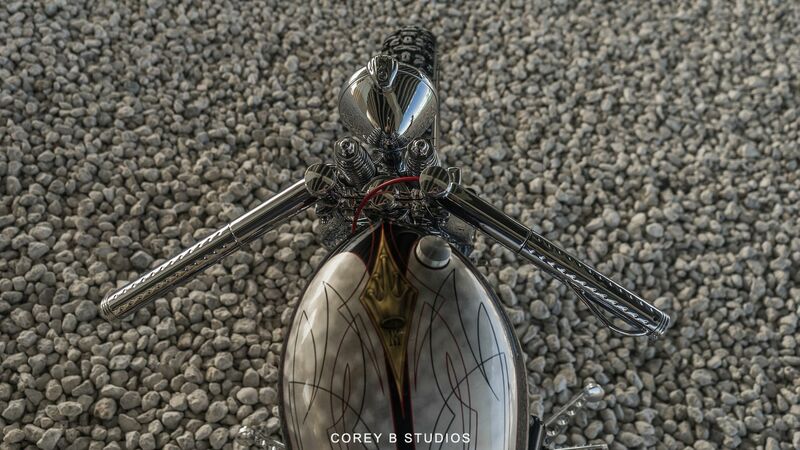 Handmade Fuel tank by Warren Lane, bottom of tank is polished stainless, hidden mounts. 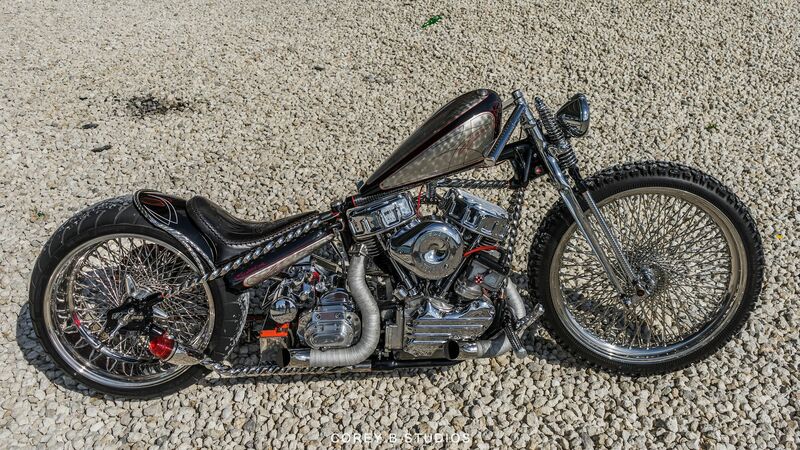 93” Panhead, STD heads, S&S carb, Sifton 540, Morris G5 magneto, runs, starts, and tuned perfefectly. 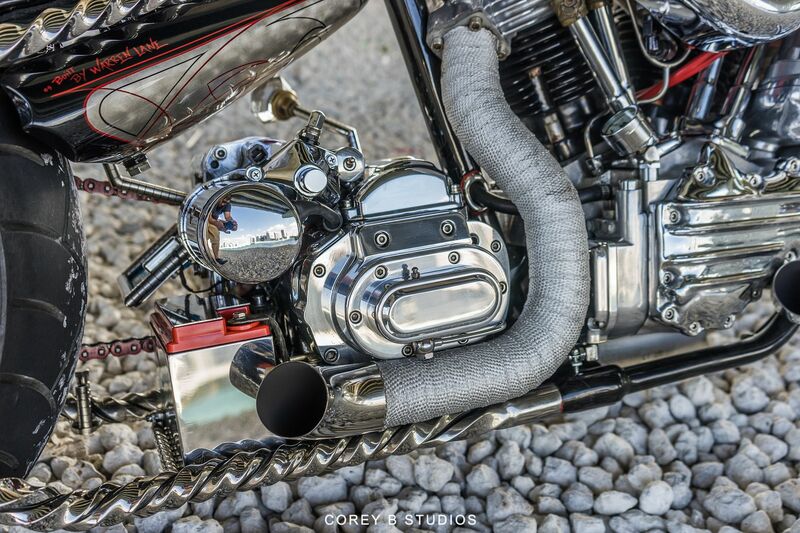 Hand Made steel oil tank by Warren Lane , with hidden polished stainless feed line, and hidden return and breather lines. 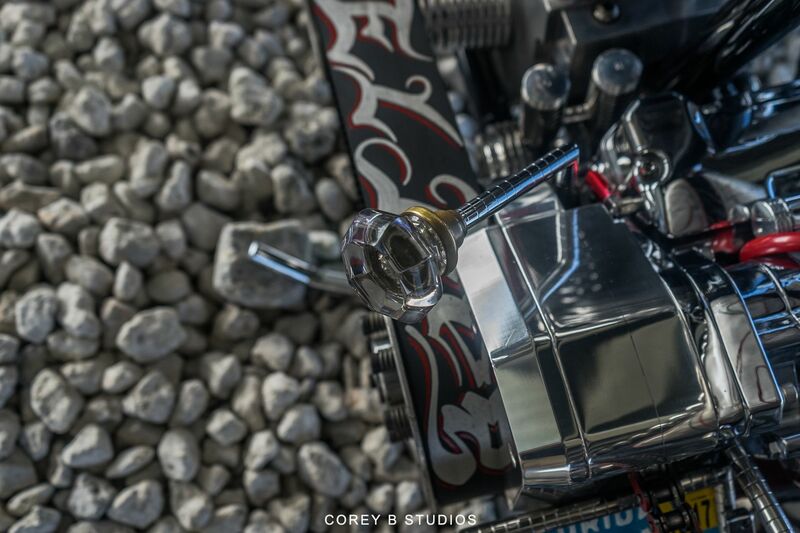 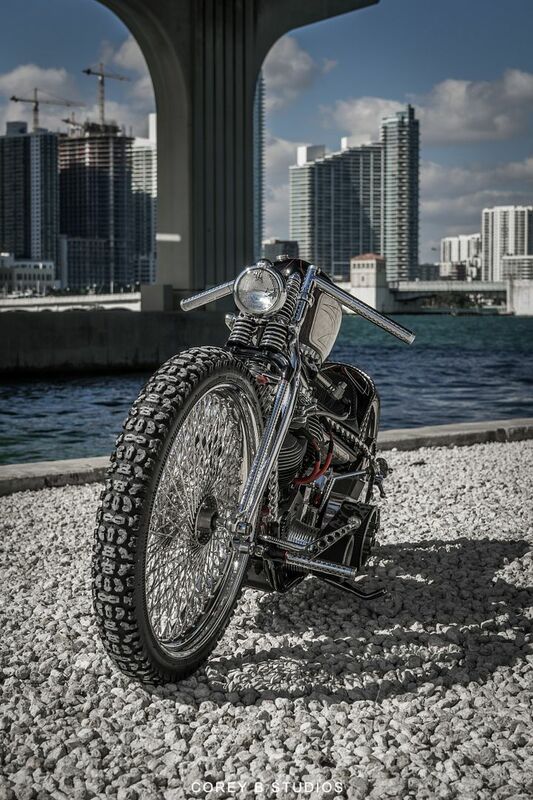 Suicide shift 6 speed in a chromed Delkron case, custom shift leaver by warren lane and cut glass shifter handle. 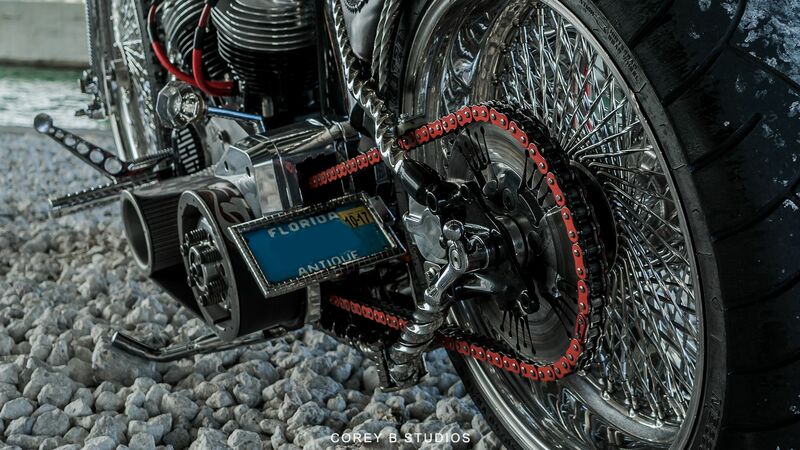 BDL 3 inch electric start belt drive, with covers machined and bolted on. 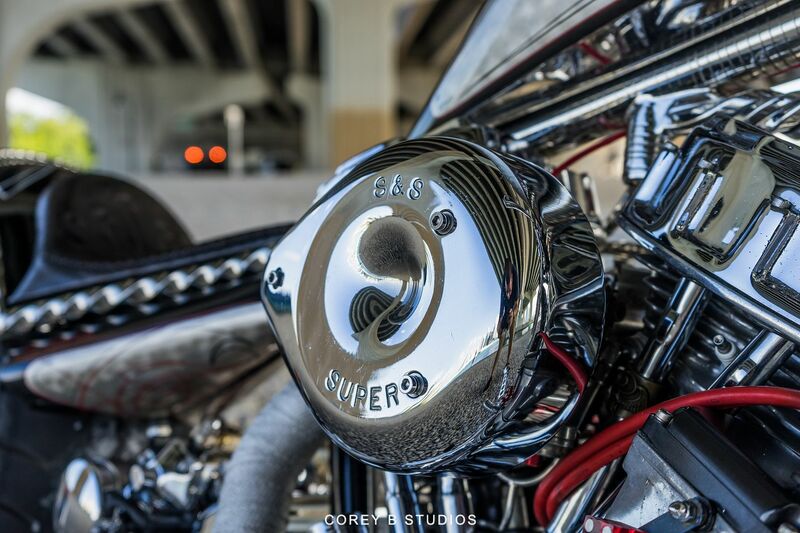 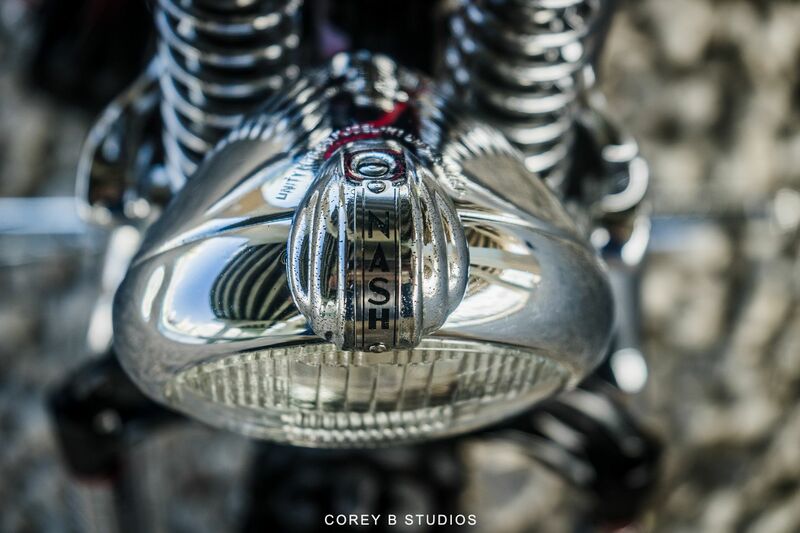 Chrome spyke super starter, custom push start button on end of starter. 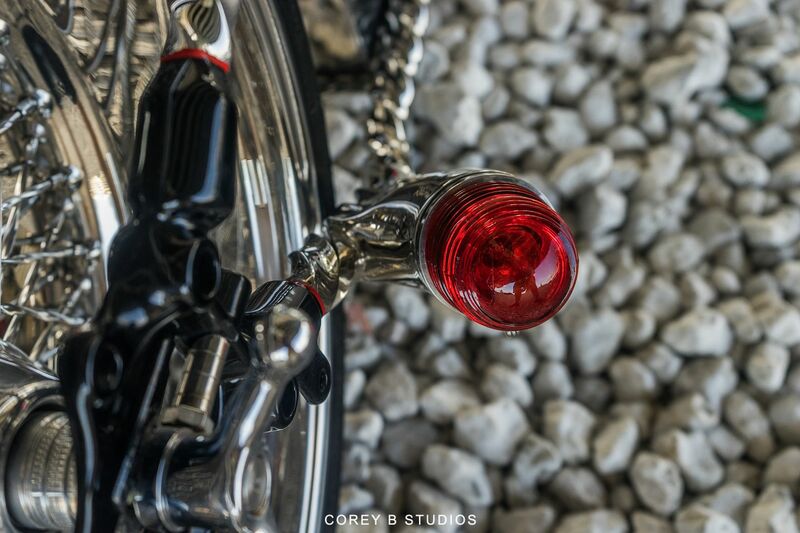 Handmade taillight by Warren Lane using a 1954 Cessna beacon light. 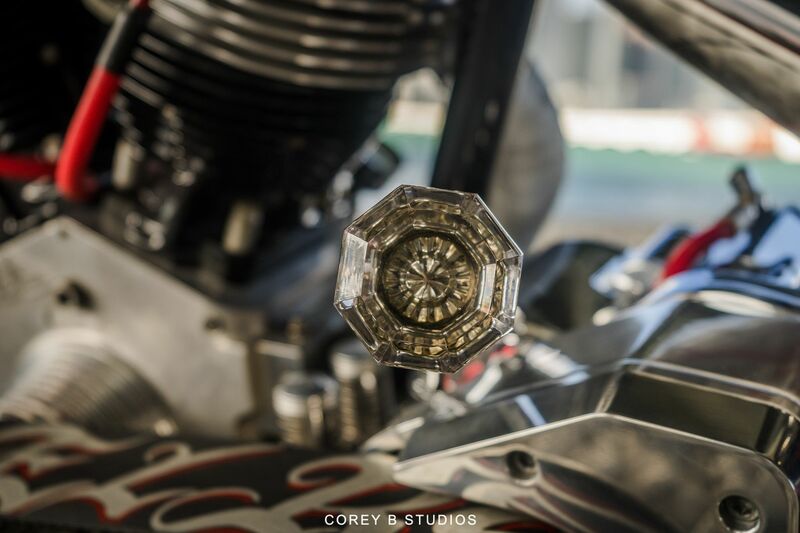 Exile sprocket brake with 48 tooth custom sprocket with water jetted crowns, 20 tooth front sprocket (wheelie machine). 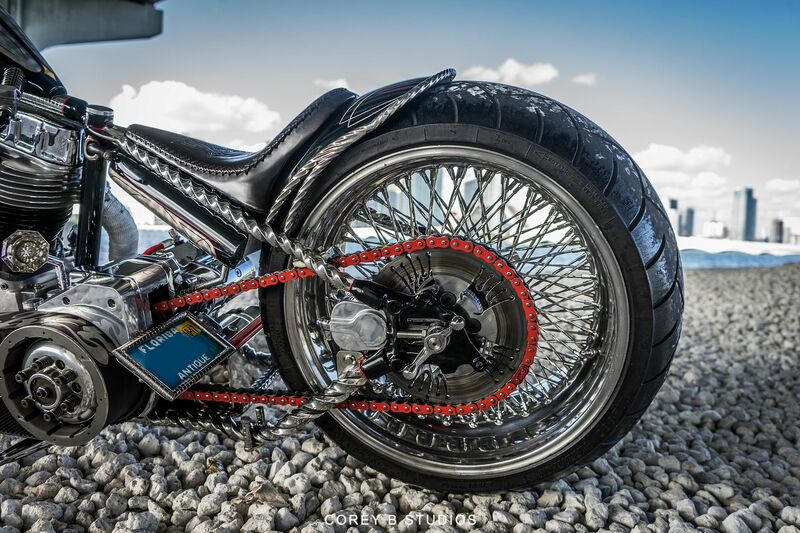 Custom drive chain jack with red wheel. 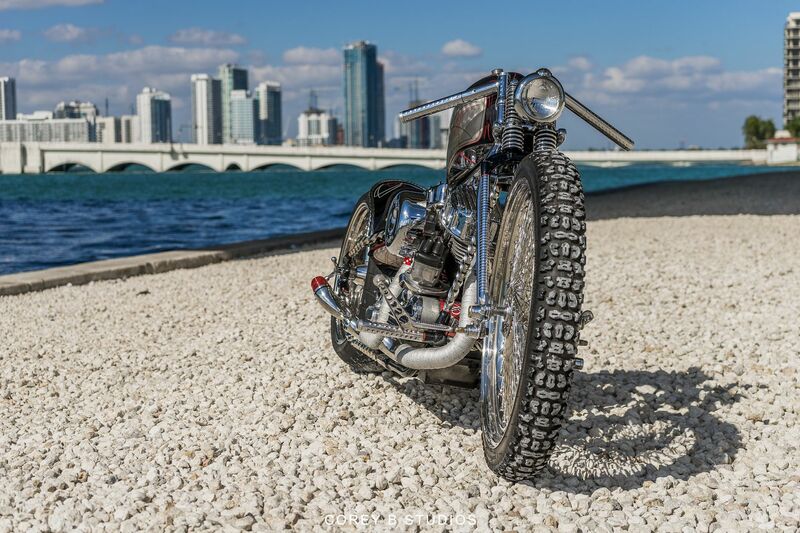 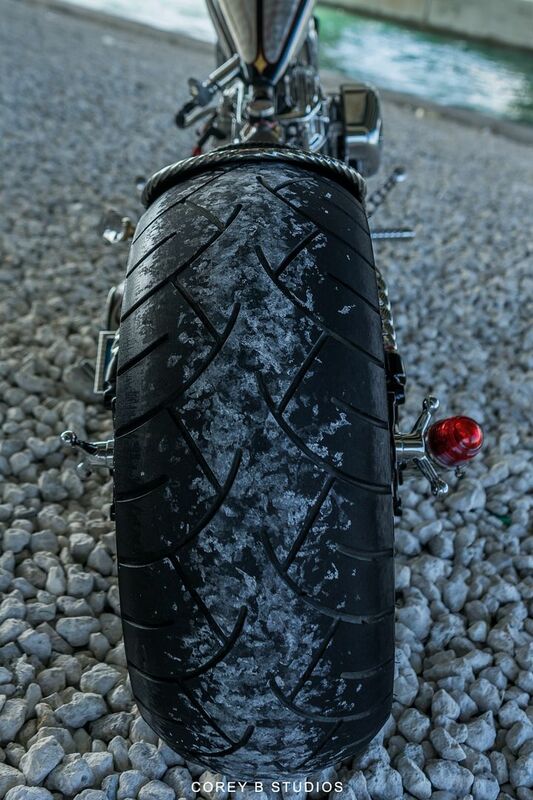 Steel handmade fender by Warren Lane with ¼ inch gap between tire and twisted stainless fender border ( no rub @120 mph!). 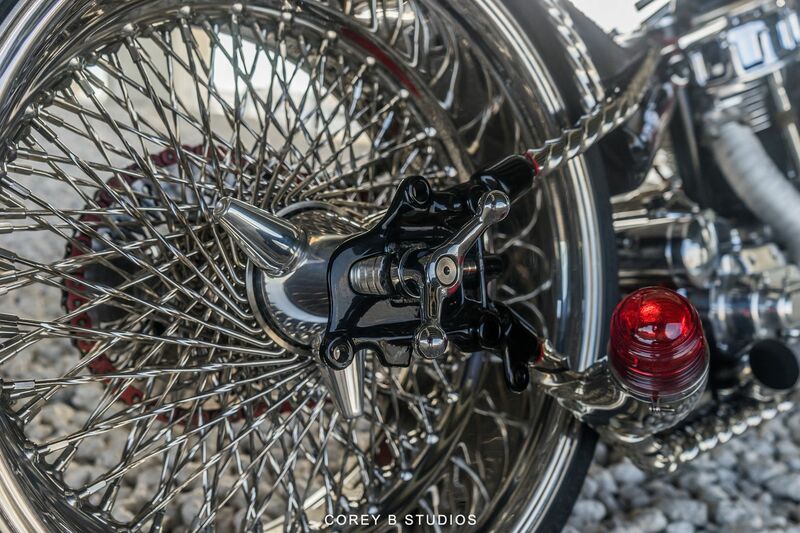 Handmade rear wheel spinner by Billy lane modified by Warren. 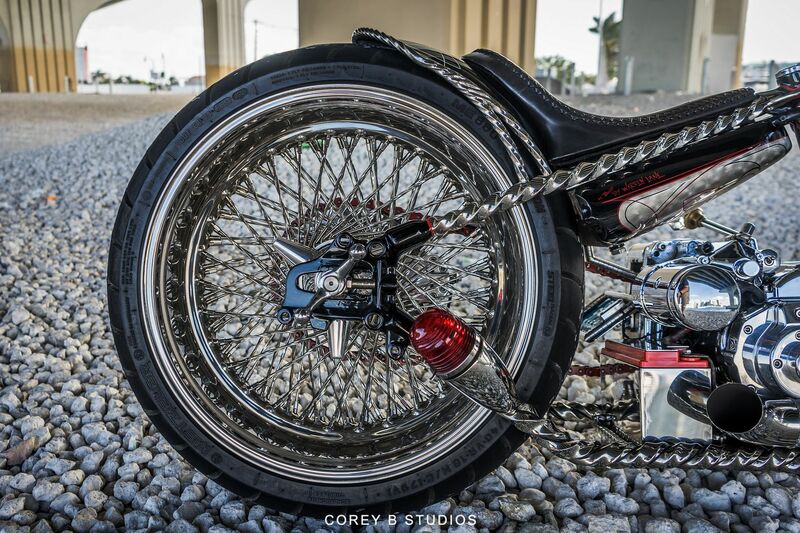 18 X 9” polished stainless rear wheel, 240 tire. 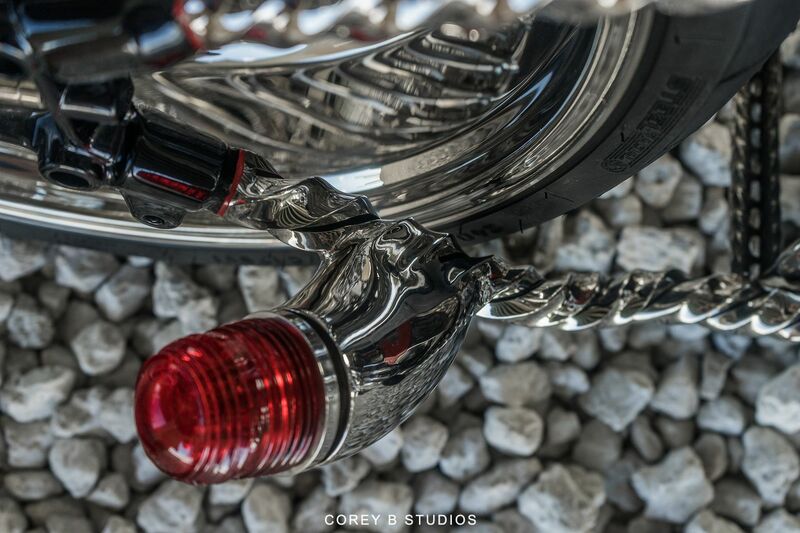 2 ¼ stainless tip on 2” heat wrapped hand made exhaust pipes, hidden mounts. 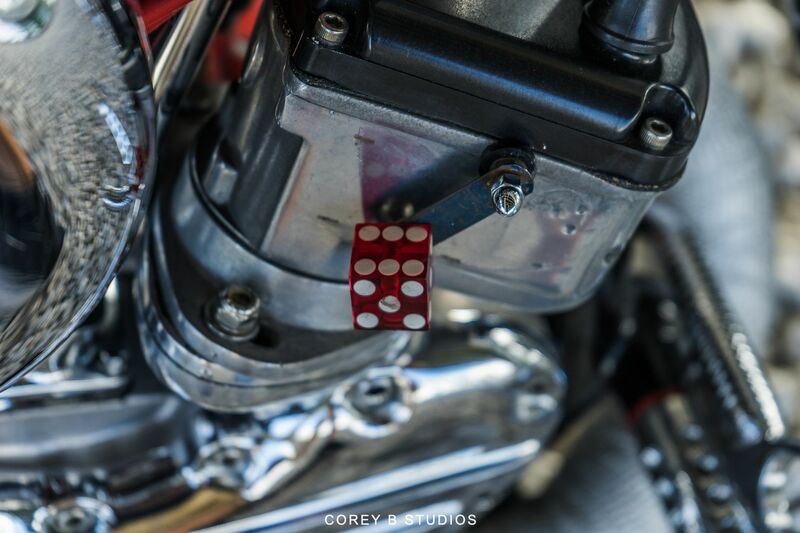 Uniform aluminum buttons on end of all tubing, also used for pedal buttons. 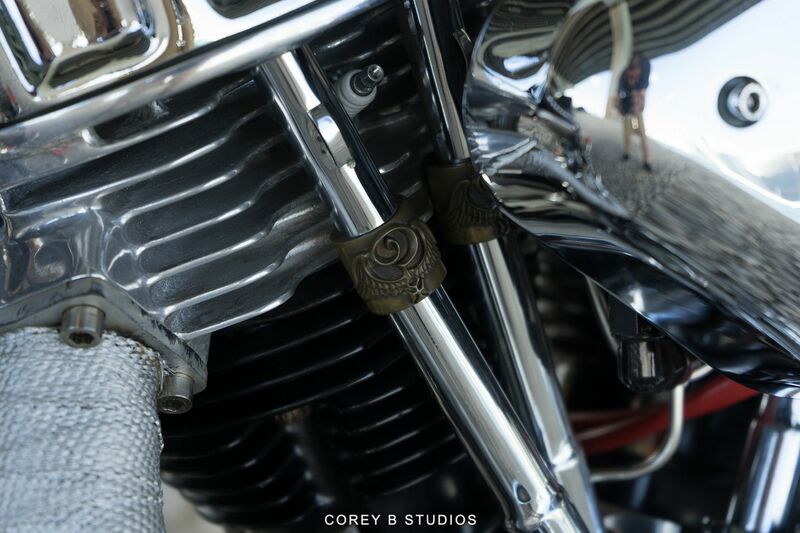 Hand made aluminum spacer for front pulley. 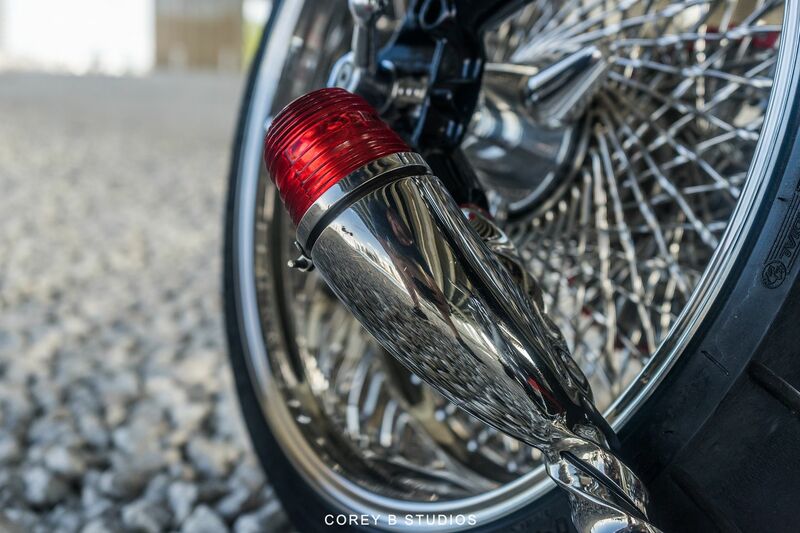 Miniature LED light for tag light. 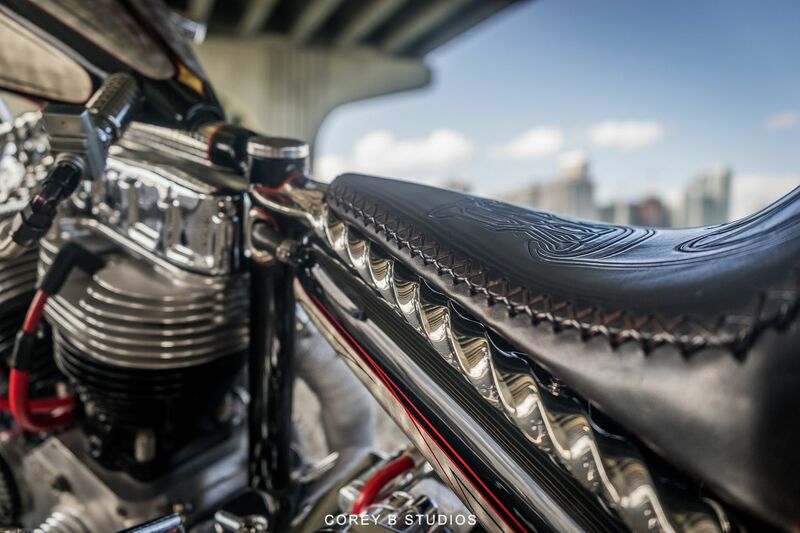 Handmade velocity stack by Billy Lane also comes with Goodson air cleaner for everyday riding. 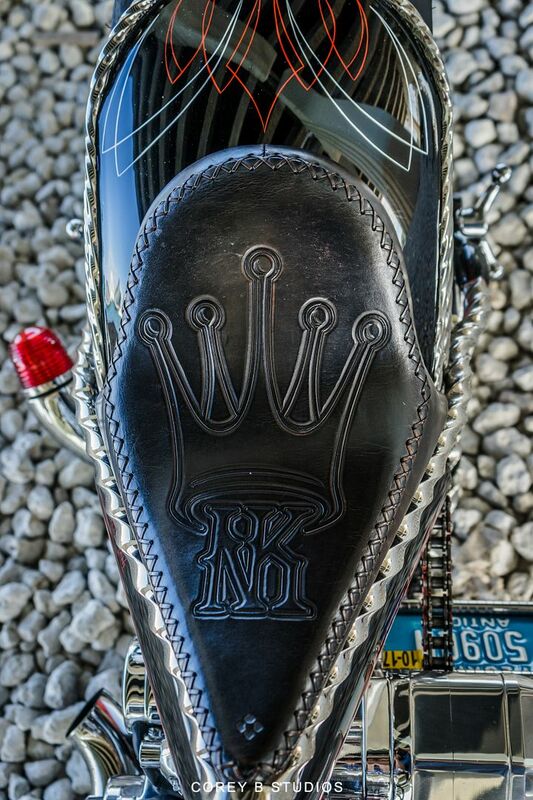 Seat, the one and only Paul Cox of Paul Cox Industries http://www.paulcoxleather.com/home.shtml He is the best in the business, Indian Larry, Exile, Jesse James, Hank Young, Warren lane, Billy Lane, to name a few, all choose Paul to craft there seats. 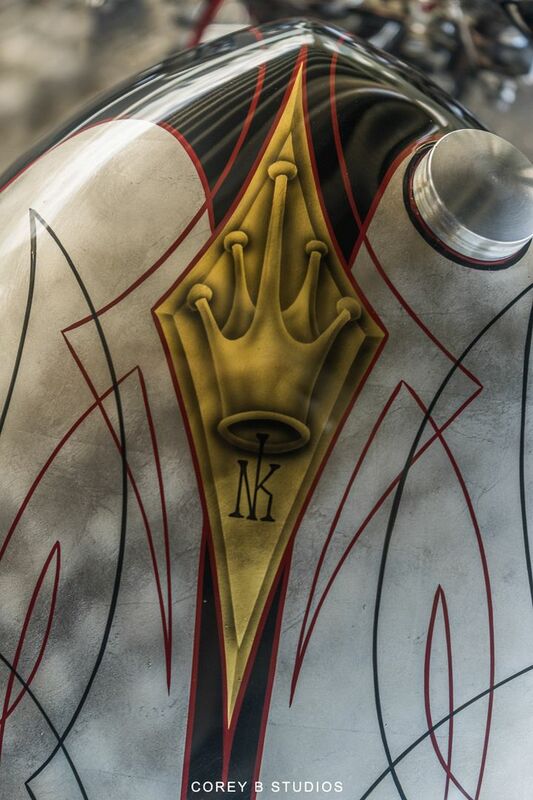 Paint by the one and only Robert Pradke http://www.customautodesign.com/ he is the best! 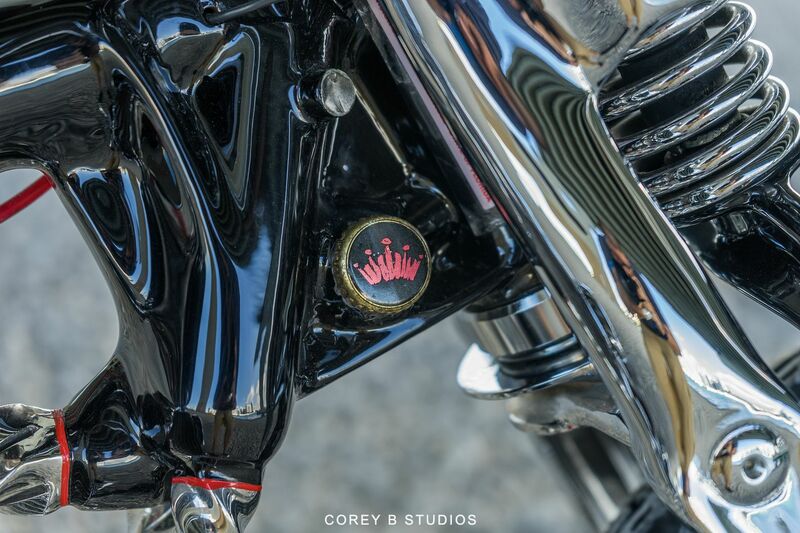 Colors Black, sterling silver leaf, with red, Black and White pin striping and painted EL Rey logo on 3 inch primary belt. 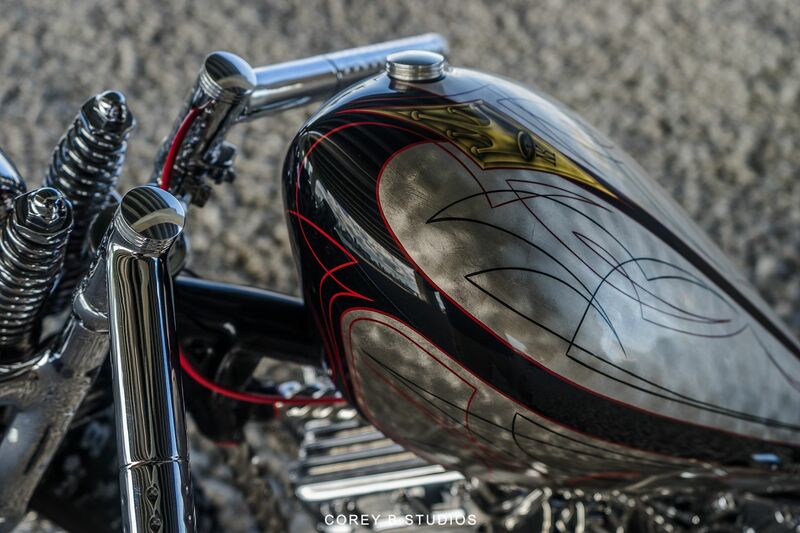 Another celebrity painter / artist. 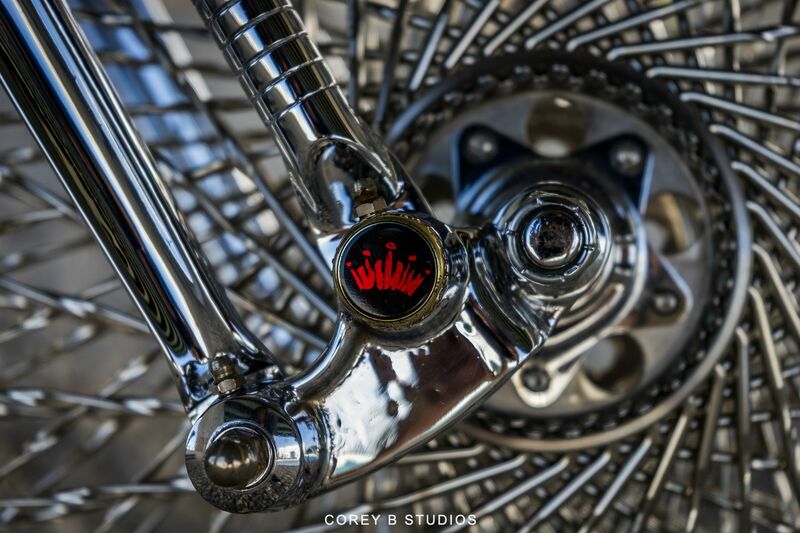 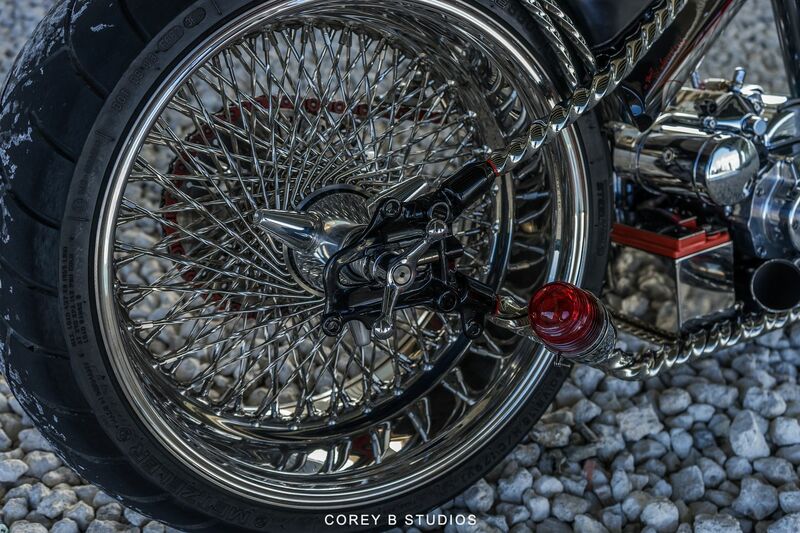 The details and craftsmanship are what separate this bike from the rest. 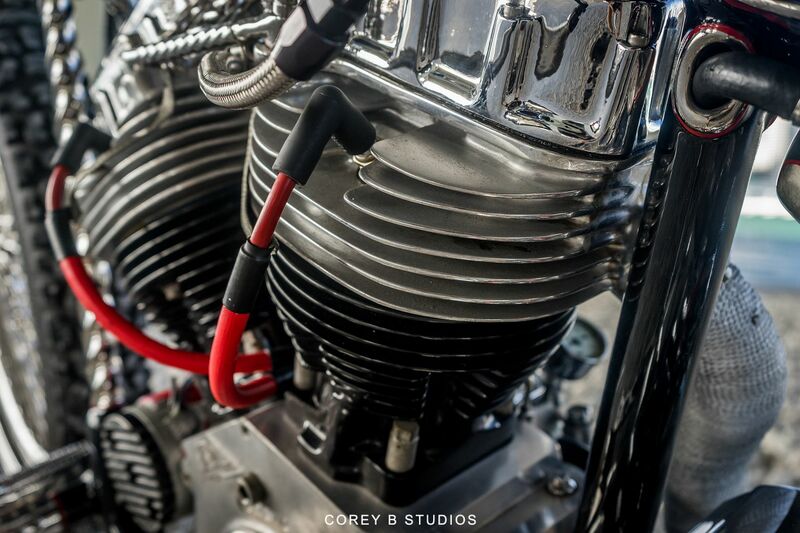 It was built without compromise. 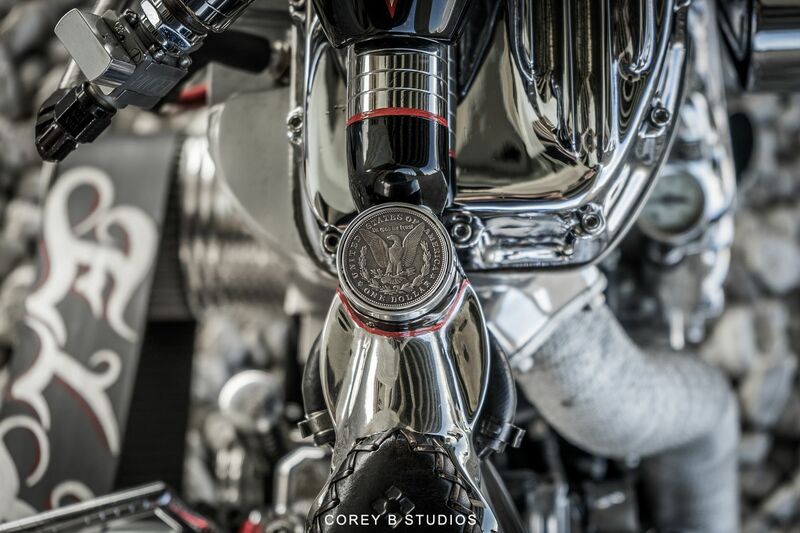 No sacrifice was made for time or money. 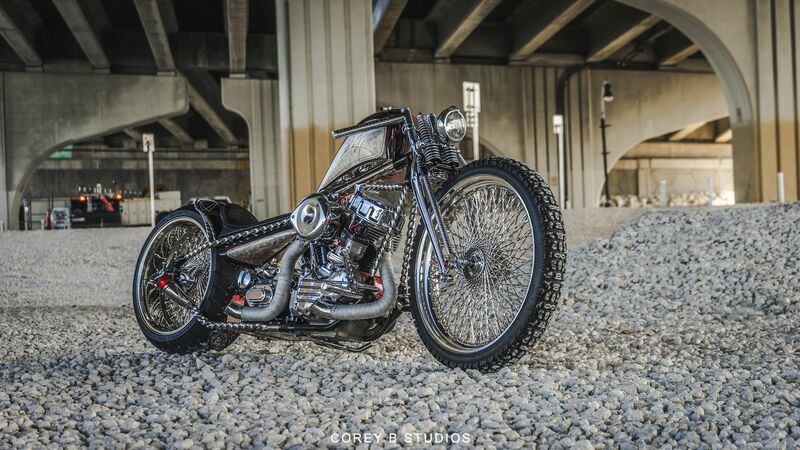 This bike rides like it looks…Awesome, hard, and fast. 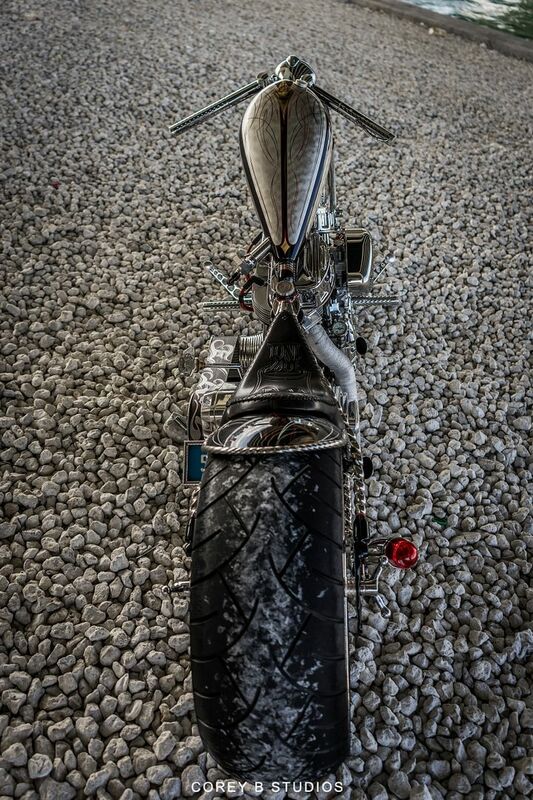 It goes 120 mph no problem. 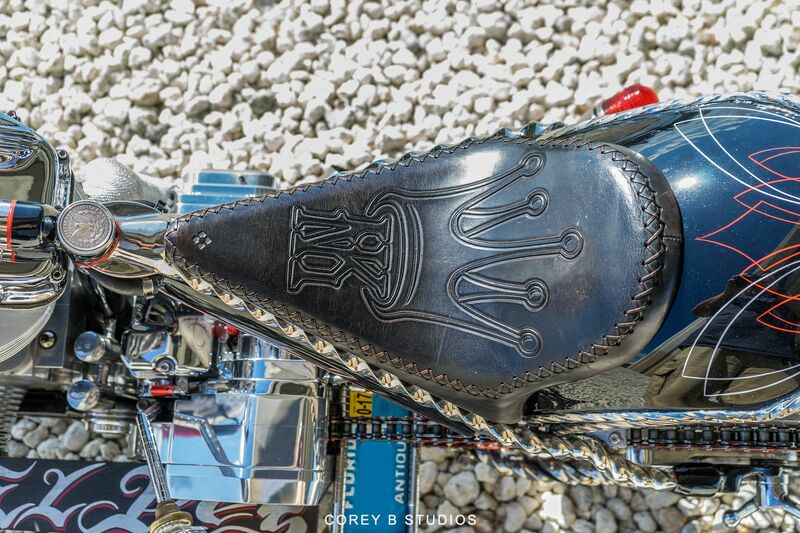 -The Heritage 05, Wildest Bike show in the south, Pro class 3rd place. 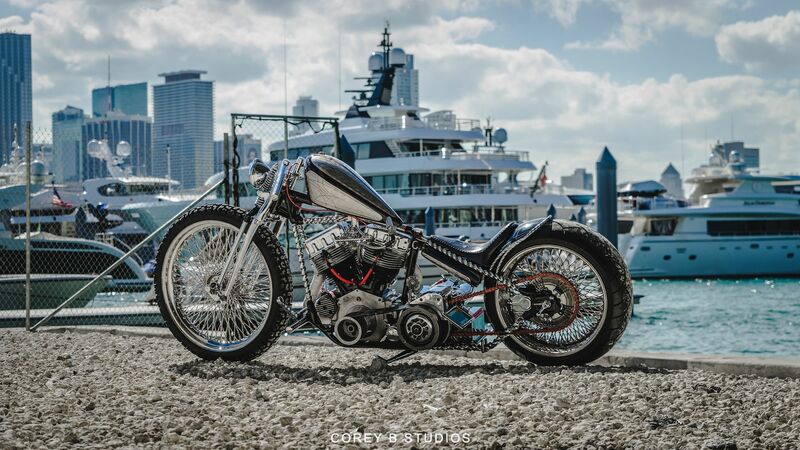 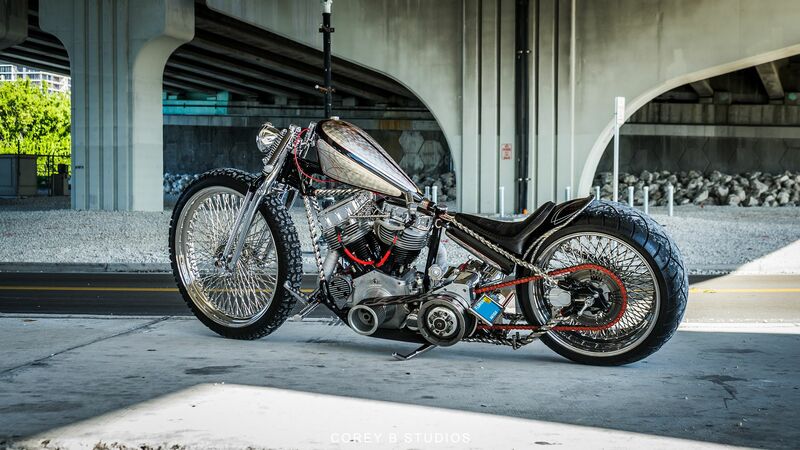 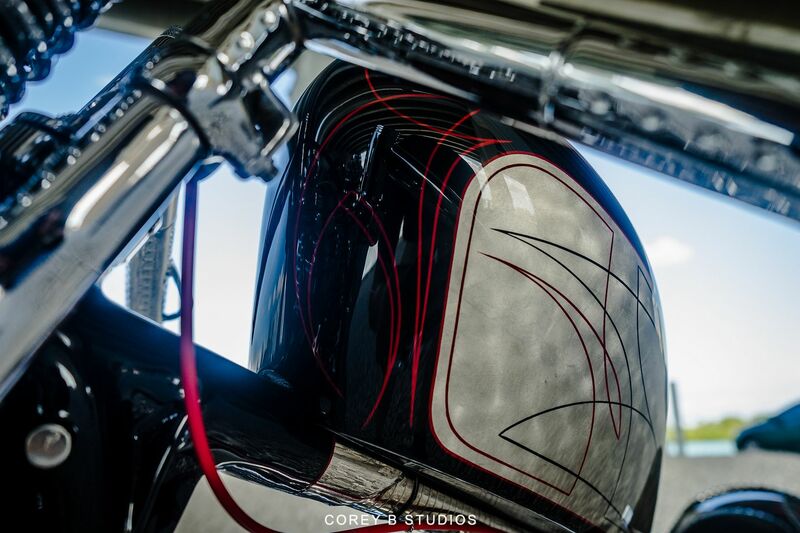 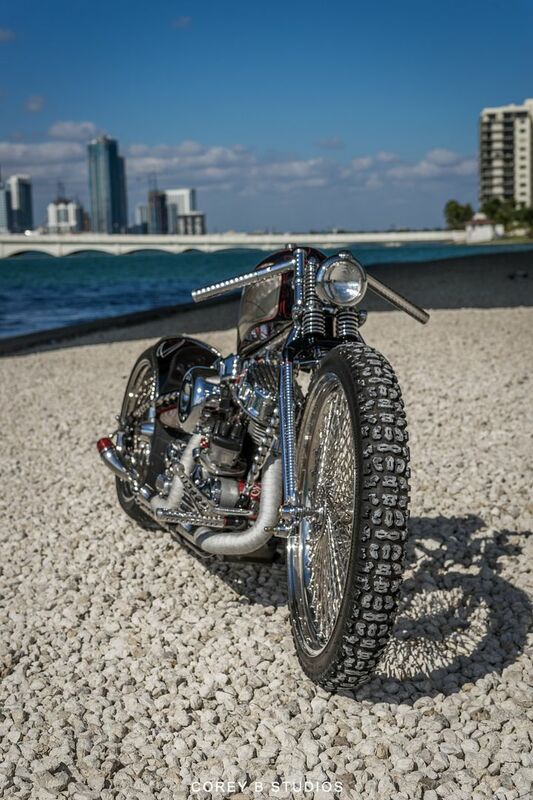 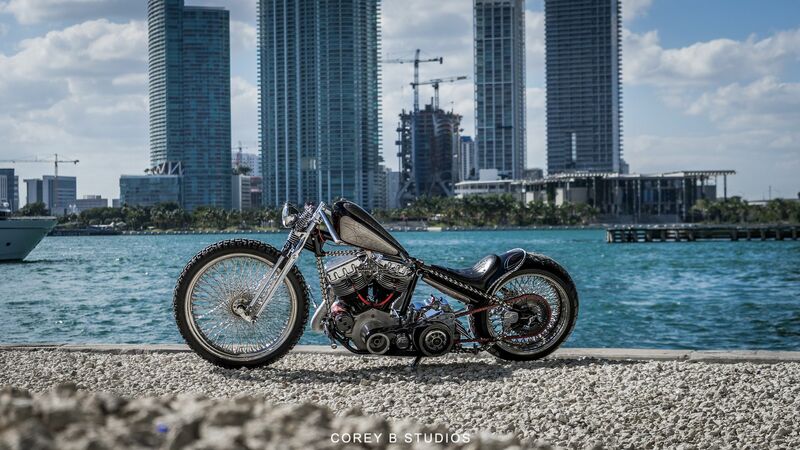 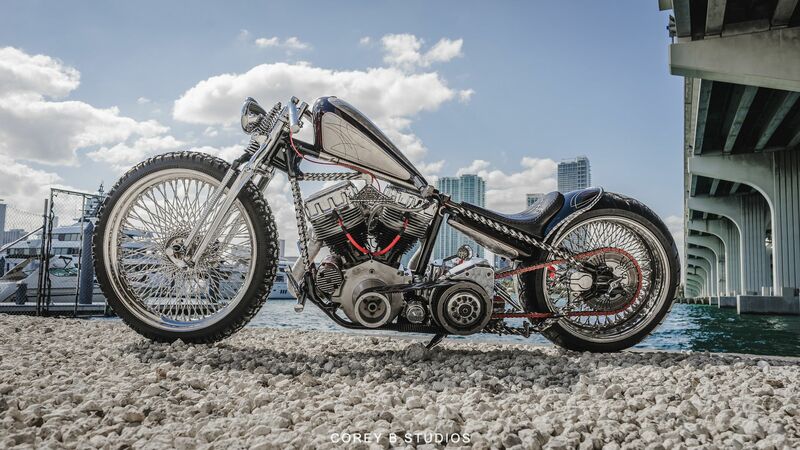 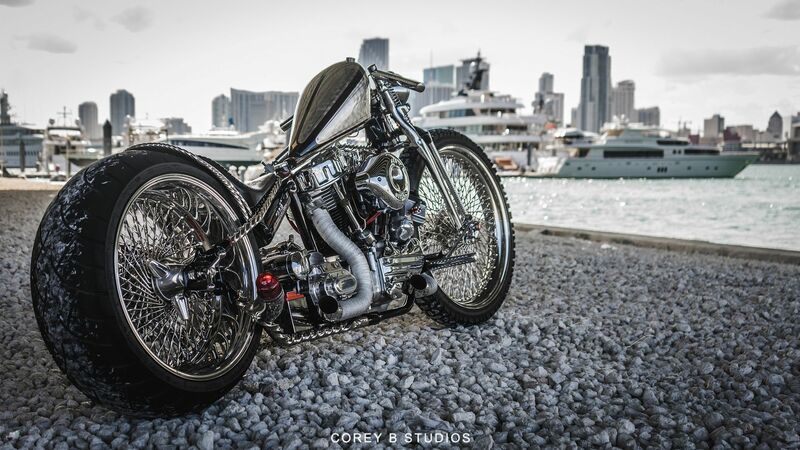 -Official AMD World championship of bike builders, LA 05, 1st place modified, Harley Davidson presented by custom chrome. 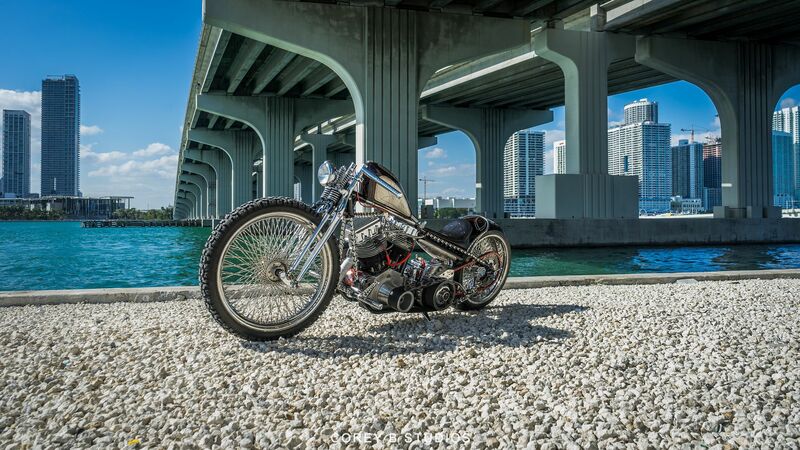 “EL Rey” was featured on speedvision “ American Thunder” 04/ 26/ 2005. 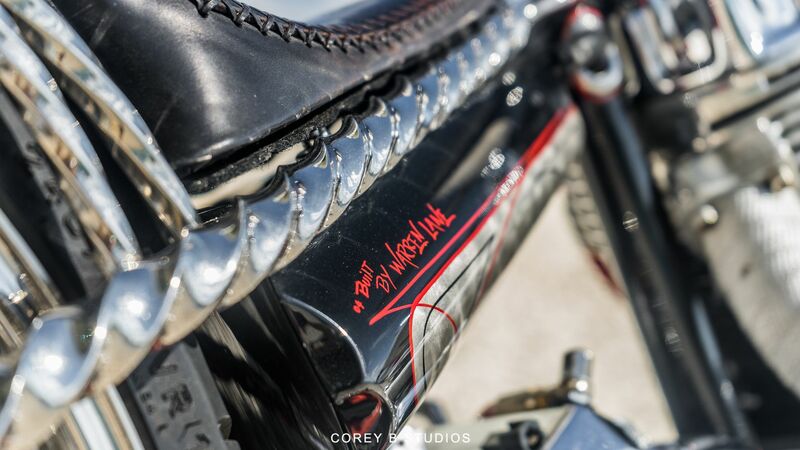 Also, a full DVD film was made of every aspect of the build of this bike including sound track and studio shoots. 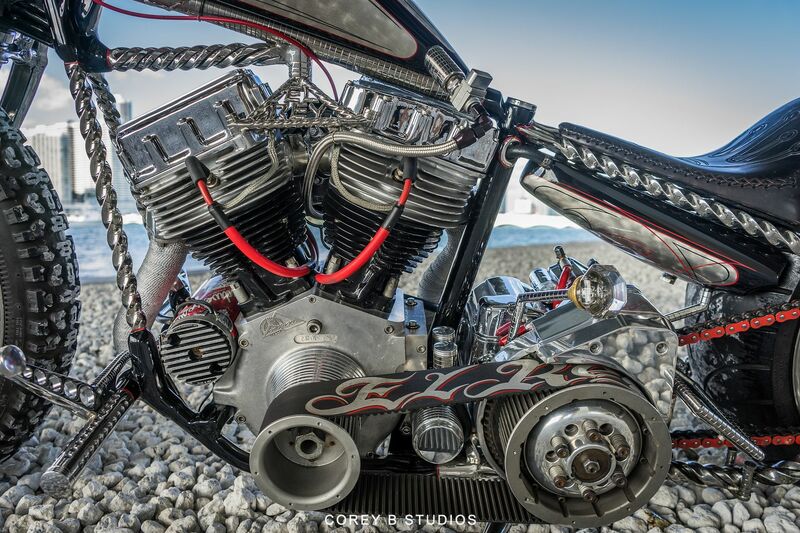 Could be coming to a TV near you soon! 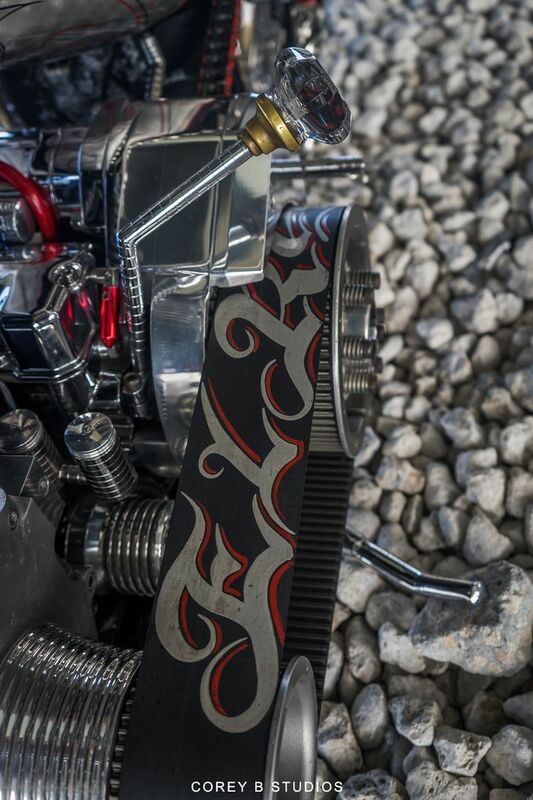 And lots more press that we didn’t get copies of.